Enterprise has been tasked with delivering a famous mediator to a planet torn by centuries of war, with strict orders not to interfere directly. 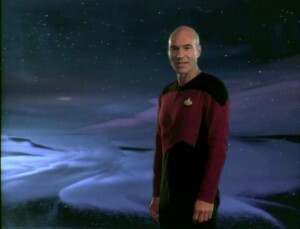 When they arrive at the mediator’s planet a long distance away, Riker interrupts Picard’s re-watch of The Planets so the captain can make a “simple ceremonial greeting,” though he urges Picard to be careful. There doesn’t seem to be anything to worry about because when Picard, an exceptionally grumpy Worf, and Troi beam down, no one is there. Enterprise picks up delegates from warring planets in the Beta Renner system, the animal-like Anticans and snake-like Selay, unlikely new candidates for Federation membership. En route to planet Parliament, where their guests can hopefully work out their issues peacefully, perhaps over a nice home-cooked meal, they happen across an unusual energy cloud. 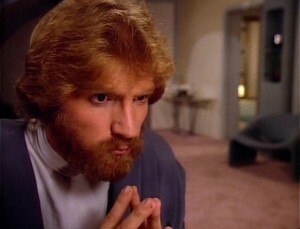 They swing by for a closer look, and a powerful electrical discharge from a sensor panel envelops Worf, knocking him out.